View More In Training Wheels. 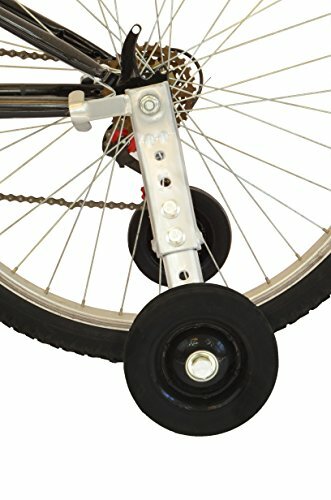 Lumintrail training wheels are perfect for learning to ride a bike, and for assisting riders that have trouble maintaining balance. Easily adjustable to fit most bikes with tires from 20" to 26" with strong reinforced steel construction. Designed to be used for riders up to 220 pounds. *Important note: If installing on a bike with exposed wires or tubes for braking or gears, be sure to move them outside of the attachment point to avoid pinching between the frame and training wheels. Pinching the cables or tubes that control the rear of the bike can adversely affect the performance of the bicycle, preventing the changing of gears or braking in the rear tire. Easily Adjustable to Fit Most Bikes 20" To 26"
If you have any questions about this product by Lumintrail, contact us by completing and submitting the form below. If you are looking for a specif part number, please include it with your message.